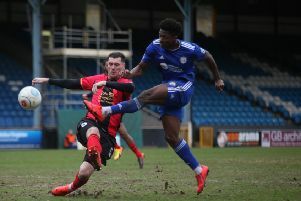 FC Halifax Town had the better chances but were unable to convert them as they drew 0-0 against a below-par Barrow side. The match never really caught fire and followed a similar pattern to The Shaymen’s previous outing at Solihull, in which they produced some promising openings, but weren’t clinical enough when it mattered to earn the result they probably deserved on the balance of play. No other side has drawn more games in the National League now than Halifax, and while a draw at Barrow is far from a poor result, it was a case of what might have been for Town, against a home side that struggled to get going. Scott Quigley nearly scored five minutes in, but keeper Joel Dixon just got back in goal in time to palm away his header after the keeper had failed to reach a cross that was headed back by Matty Brown. Matty Kosylo was then frustratingly caught offside when Cameron King had slipped him through to the left of the penalty box. Quigley then turned a Barrow defender one way then the other close to the angle of the six-yard box before drilling a low shot off the outside of the near post. What chances there were dried up as the first-half went on, with the game descending into a scrappy contest for large parts of it, in which neither side appeared to possess the composure or quality to consistently hurt the other. Both sides produced some decent passages of approach play at times, but that was equalled by how many times the two teams gave the ball away needlessly. James Berrett, Cameron King and Michael Duckworth were the main exceptions for Town, all of whom were most effective at retaining the ball, but not enough of their team-mates joined them. Barrow’s Jacob Blyth diverted a cross wide from the right flank, while John Rooney had a couple of efforts from just outside the box blocked, with Nathan Clarke and Matty Brown their usual reliable selves at the heart of the Halifax back-line. Quigley had offered good movement and awareness up-front, and the opening half was bookended with chances for the loanee, as he was picked out by Berrett’s incisive pass forward, but fired too close to Dixon from 20 yards. Kosylo then had another goal chalked offside from Clarke’s through ball, with Town the stronger threat going forward by half-time. Barrow’s front-men Blyth and Dior Angus had been given little service. Barrow were badly lacking inspiration and creativity going forward, with runners going one way and passes the other, or too often choosing the safer option of a high ball rather than something different. Halifax were working hard - as evidenced by King’s interception high up the pitch on the right - but couldn’t find the cutting edge - as evidenced by King’s overhit cross. The hosts continued to be wasteful in possession, much to the frustration of their supporters, but had been tighter at the back since the interval; when Kosylo broke forward around the hour mark, he was eventually left with little option to shoot left-footed from 25 yards, and it flew off target. Blyth curled a left-foot shot over the angle of post and bar from 20 yards before Rhys Norrington-Davies blazed a shot over from an angle inside the box as Barrow finally injected a bit of urgency. But still the prospect of a goal looked distant, with Barrow too untidy and sloppy, and Halifax, while working hard to keep the hosts at bay, were offering little going forward. When a free-kick did fall to substitute Jonathan Edwards in a yard of space, the striker was off balance and badly miscued his shot wide. Barrow: Dixon, Barthram, Norrington-Davies, Elsdon, Granite (Hird 53), Jones, Taylor, Rooney (Kay 70), Burgess, Blyth, Angus (Hindle 72). Subs not used: Brown, Molyneux. Halifax: Johnson, Duckworth, Clarke, Brown, Skarz, Berrett, Maher, Southwell (Tomlinson 70), King (Preston 81), Kosylo, Quigley (Edwards 74). Subs not used: Rowley, Ferry.